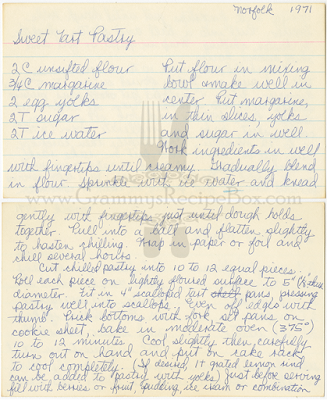 This recipe is written in ballpoint pen in my Grammy's handwriting. 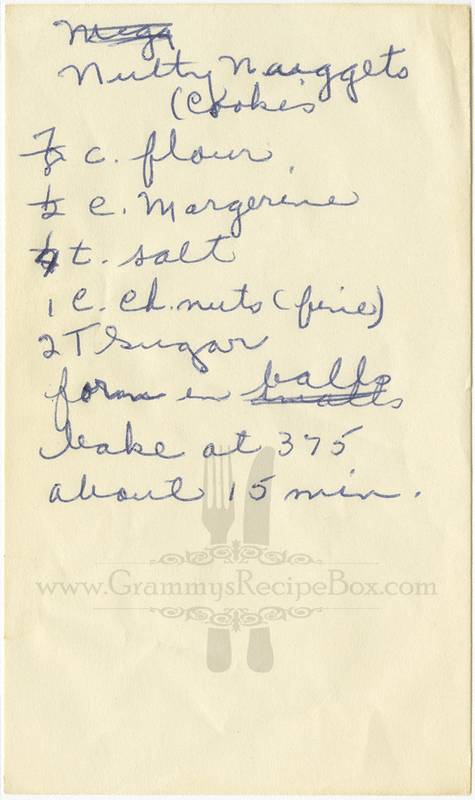 This recipe is written in ballpoint pen in my Grammy's handwriting and is dated 1960. 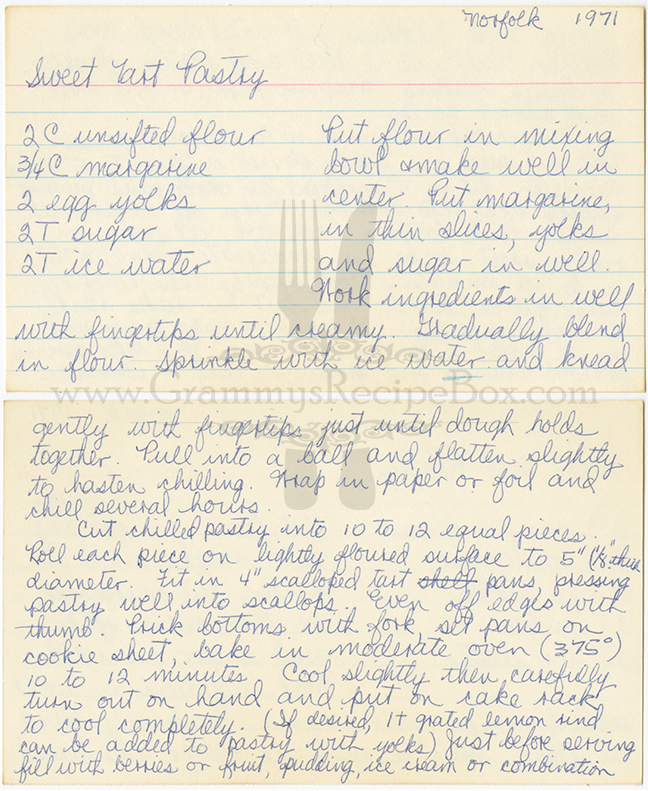 Joanie was Elsie's youngest daughter who ended up getting this recipe named after her because of her love for them (hence the well-worn recipe card seen above). 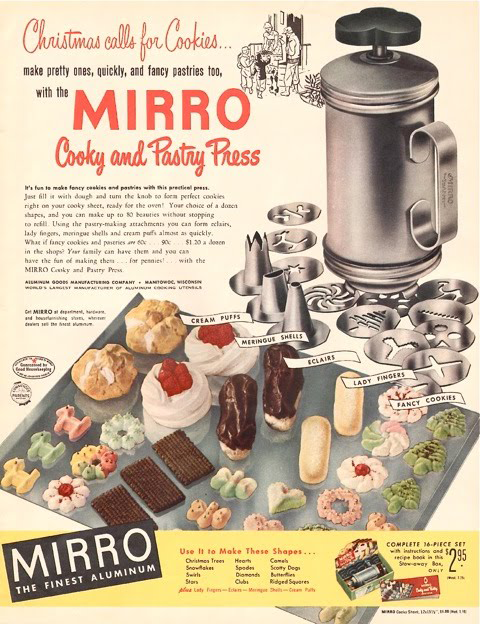 This is a simple butter cookie that many families came to adopt as a Christmas tradition when the Mirro Cooky and Pastry Press came on the market (see ad below). 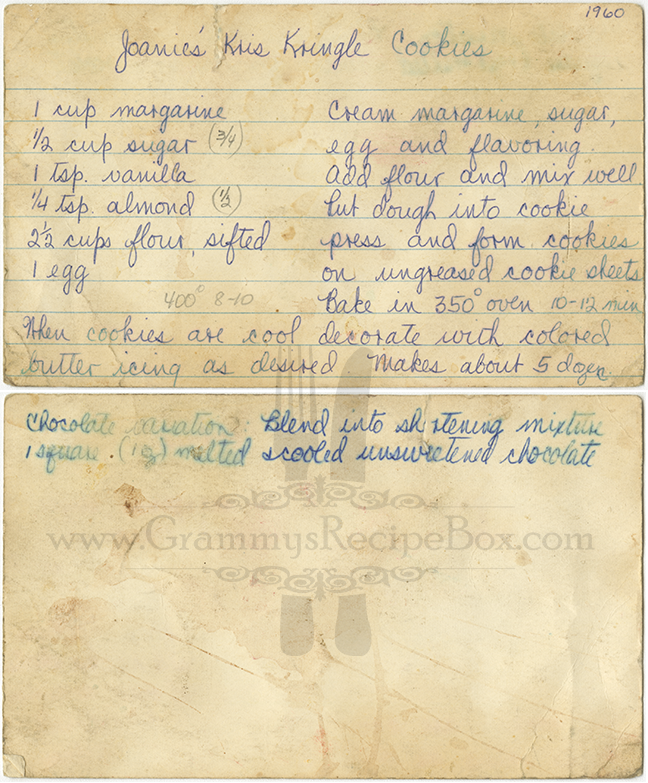 I still have my Grammy's cookie press in it's original shipping box. Christmas just isn't the same until I've had one of these delightful morsels. Grammy wrote some variant measurements, temps, and times in pencil. This may be what she found to be preferable in her kitchen at 3500 feet above sea level in elevation. I have yet to test these measurements in our kitchen (that is close to sea level in elevation) to find which is best for our locale. I've included the variants in parentheses below. 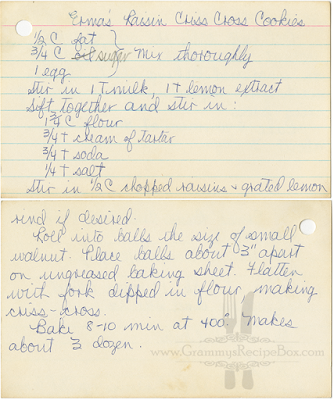 Bake in 350°F (400°F) oven for 10-12 (8-10) minutes. 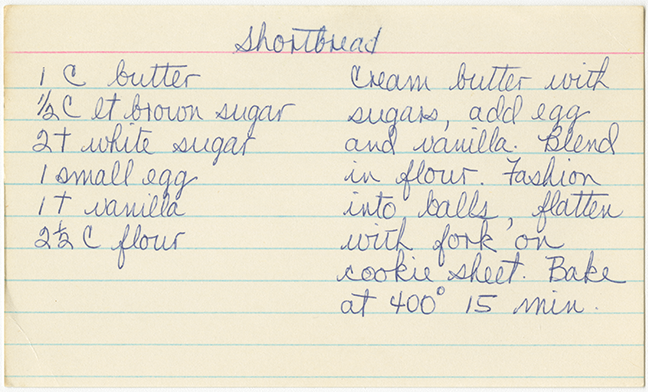 This recipe is written in ballpoint pen in my Grammy's handwriting. Erma was Elsie's stepmother and the great grandmother I was fortunate to know and love as a child. These cookies were among my favorites. Erma (I knew her as Grandma Munce) had a porcelain cookie jar stocked with cookies every time we came to visit her. 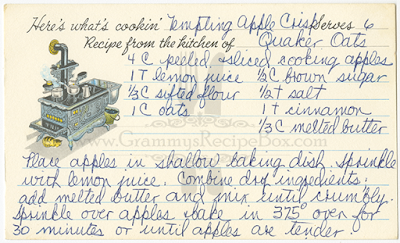 The sound of the clink of a ceramic cookie jar lid takes me right back to Grandma Munce's kitchen. 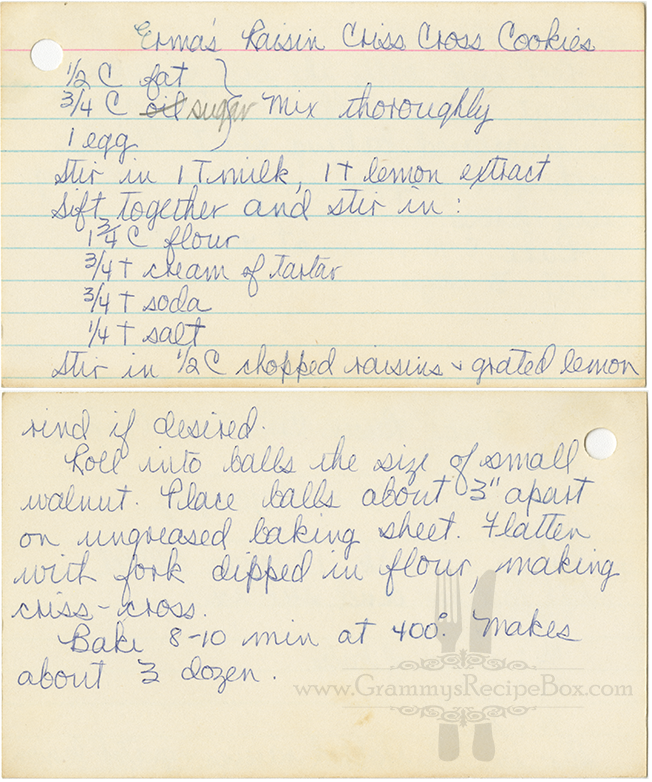 This recipe is written in ballpoint pen in my Grammy's handwriting. 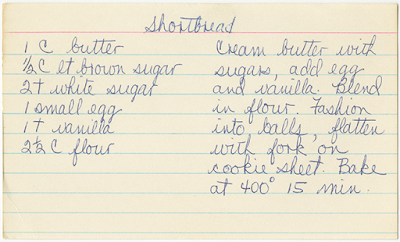 Although it is undated, I can guess this is probably from the early 1970s based on the recipe card it's written on. 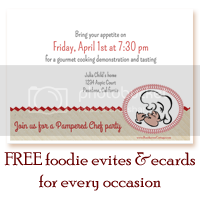 It is attributed to Quaker Oats. This recipe is written in ballpoint pen in my Grammy's handwriting. It is dated 1971 and is attributed to "Norfolk". 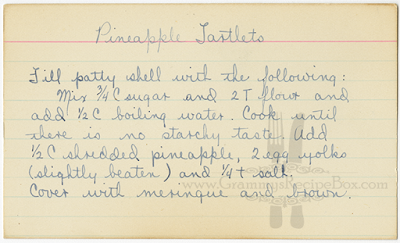 It is a versatile recipe for making tart shells that can be filled with a filling of your choice. 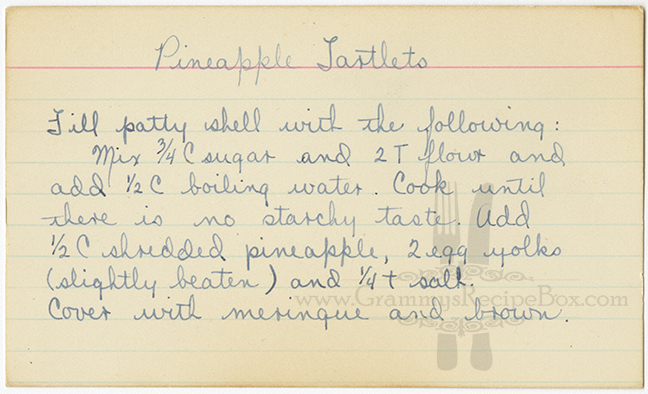 Fit in 4-inch scalloped tart pans, pressing pastry well into scallops. 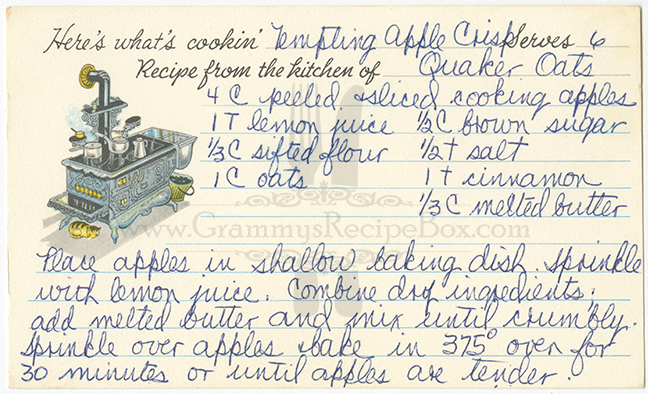 This recipe is written in fountain pen and appears to be my Grammy's early handwriting.